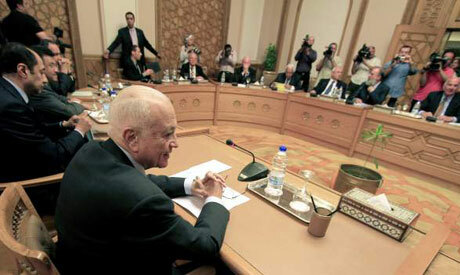 The newly-appointed Secretary-General of the Arab League, Nabil Al-Araby, left, meets leaders of the Israeli Peace Initiative, a group of 70 high level Israeli figures who are promoting a peace agreement in the Middle East based on the principle of a two-states solution for the Arab-Israeli conflict, in the Foreign Ministry in Cairo, Egypt, Thursday, (AP). Moved by fear and anxiety in light of the Arab Spring revolutions, and the loss of its strategic ally the Mubarak regime, Israel is now resorting to its usual pre-emptive policy–proposing a peace initiative in response to the Arab initiative which was shelved by Tel Aviv for nine years without an official response. Sources involved in the Egyptian-Israeli dialogue about the proposal (known as secondary not primary track talks) disclosed that Israeli President Shimon Peres helped draft the proposal. Some 52 Israeli officials visited Cairo, including 18 in the security and information apparatus (six of whom are heads or deputies of those agencies) as well as diplomats and politicians. The meeting is part of an Arab tour that will also head to Qatar and possibly Bahrain, Algeria and Morocco. Peres suggested the tour begin in Egypt as Cairo prepares to turn over a new leaf in its international relations and foreign policy. Shahal said they decided to work as a group to convince Israel to accept the Arab peace initiative and submit a comprehensive response to it, to use it as an overall vision and foundation for a permanent settlement, and thereby guarantee an end to all forms of Arab-Israeli conflict. “For these reasons, we came to munificent Egypt,” he said. Danny Danon, former Israeli ambassador to the UN agreed, adding: “there are singular moments in history, like now, when we must work to conclude a peace deal.” This is perhaps the same phrase which US President Barack Obama used in his speech 48 hours after the delegation headed to Cairo. It met only with the Foreign Ministry and the Supreme Council for Foreign Affairs (SCFA). Sources in Cairo said the delegation’s proposal seems to be identical to the one in Obama’s subsequent address. But if Cairo does not support the initiative, political and economic pressure could be exerted – as witnessed during the Mubarak era, according to these sources. Ahram Online received a copy of the three-page Israeli initiative which was translated into Arabic and titled “The Israeli Peace Initiative in Response to the Arab Peace Initiative.” The Israeli delegation suggested a roundtable discussion about the proposal at the Foreign Ministry with Egyptian media, but the meeting did not take place. The initiative suggests nothing new and is a summary of Israel’s vision of three previous initiatives. According to Emad Gad, the editor of Al-Ahram’s “Israeli Excerpts,” these are former US President Bill Clinton’s peace plan, the Geneva Initiative and Camp David 2-–which Egypt rejected because one of its main stipulations rescinded the right of return of Palestinian refugees. The current proposal does not mention this right, except to recognise the right of refugees to monetary reparations and the possibility of some refugees returning to the new state. The principles of the initiative confirm that the central tenets of permanent settlement--ensuring security, establishing normal relations, and ending all aspects of the conflict—take into account security measures, water needs, demographic realities, and the interests and needs of the three monotheistic religions. Also, resolving the Palestinian-Israeli conflict is based on the principles of two states for two peoples—the Palestinian state as a country for the Palestinian people and Israel as a state for Jews that guarantees equal civil rights for Arab citizens as stated in Israel’s declaration of statehood. Within this context and as part of a permanent settlement, Israel is suggesting the creation of a viable sovereign and independent Palestinian state in the West Bank and Gaza Strip from which Israel would withdraw. Palestine would be an unarmed state and would have full responsibility for domestic security; and the world community would play a vital role in ensuring the safety of borders and combating terrorism. Regarding borders, the proposal states the borders of the Palestinian state would be along the 4 June, 1967 border and agreed upon amendments according to the following: regional contiguity among the territories of the Palestinian state, exchange of land at a one-to-one ratio (but no more than seven per cent of West Bank territory), and taking into consideration land needed to create a safe corridor between the West Bank and Gaza which would be under the control of the Palestinian leadership. Meanwhile, the area of Greater Jerusalem would contain the two capitols of the two states, and the border would be demarcated to keep Jewish districts under Israeli control and Arab districts under Palestinian sovereignty. In Old Jerusalem, special arrangements would guarantee that the Wailing Wall and Jewish quarter are under Israeli control, while the Temple Mount and Haram Al-Sharif (Noble Sanctuary) would remain under “no sovereignty” – or God’s sovereignty – with special arrangements. According to these terms, the Islamic Religious Endowment would administer Muslim holy sites, while Israel would supervise Jewish holy sites and interests. The proposal also suggests the appointment of an international-Israeli follow-up committee to implement these arrangements.